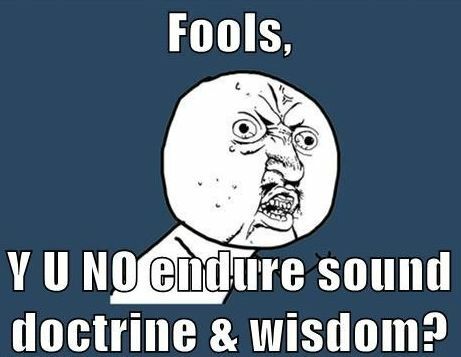 Paul knows that in the very near future there the churches he has founded will not want to “endure sound teaching.” But the word“endure” sounds as if we have sit through long and unpleasant sermons! In the context of Timothy’s commission to preach the word and exhort everyone to godly living, perhaps the sense of “accept a legal complaint” is what Paul has in mind. Rather telling all Christians that they must endure long and boring sermons, Paul means that the opponents will refuse to accept healthy teaching because it is an indictment against them. They cannot stand to hear it because it points to their own shortcomings spiritually. Paul once again describes good doctrine as “healthy” (1 Tim1:10; Titus 1:9, 2:1; using the participle of the verb ὑγιαίνω as an adjective). People are craving teaching that is like “junk food,” it might make you feel good in the short term, but in the long run it will make you unhealthy and perhaps even kill you! The time is coming, Paul warns, when people will want to hear things that their “itching ears” want to hear. These people will ignore the truth, wandering off into myths. This verb (κνήθω) only appears here in the New Testament and the Greek Old Testament. “The participial phrase probably means “in order to have their ears tickled” (EDNT 301; the word appears in Plato for literal scratching of an itch (Philebus 46c, 51d). Even in English we use the word “itch” for some desire that we need to satisfy. Applied to the preaching of the Word of God, it implies that these people will want to hear the Scripture taught, but they will want to hear things that make them feel good, things that “satisfy their itch.” In the context, this is esoteric teaching, teaching that is more interested in dark secrets of “conspiracy theories” rather than the plain (and convicting) Word of God. This is a very convicting text, and one that is very applicable to modern church experience. There are many people (myself included) that like a particular sermon (or preacher) because the “get something out of it.” It says something that they want to hear, or maybe something that they already believe. I love it when a preacher says something that I already agree with because it confirms my thinking. As a college teacher, I am always amazed how often students do not want to confront new ideas. They want to know that the things their Jr.High youth leader taught them were true. On the other hand, as a college teacher it is very easy for me to present strange and esoteric things in class. Saying “mimetic” and “intertextual” makes you sound smarter, right? In every church, there is a set of vocabulary or a few key doctrines that pastors are required to trot out from time to time to keep people in the church happy and to give the appearance that they are still teaching “healthy doctrine.” This might be a good doctrine, a solid teaching; but it also might be a particular social position, or political idea. But my guess is that Paul often taught the Scripture in a way that made people squirm. It made them uncomfortable to be told that God is their father and he expects them to be honorable children in the household of God. It is far easier if God would just give me a list of items I can achieve or rules I can keep. I am certain that Jesus’ teaching made people very uncomfortable; he confronted people directly over their hypocrisy. Why is it that we (Christians) do not want to be made uncomfortable when the Word is preached?